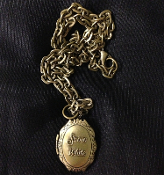 SNOW WHITE MIRROR LOCKET NECKLACE Pendant Charm - Snow White and the 7 Dwarves Disney Movie Cartoon Character Costume Jewelry - SNOW WHITE - Retro Victorian Antiqued Gold-tone Brass Metal Pewter Message Box Photo Image Container Charms, each approx. 1-inch high x 3/4-inch wide. Old-world style, cosplay hinged amulet opens to reveal mirror-finish stickers. Act out your own version of ‘’Mirror, Mirror on the wall... Who is the fairest of them all?’’ Photos can be placed inside. Inner dimensions to hold photo or lock of hair: approx. 15mm long x 10mm wide. Comes on matching 18-inch link chain with lobster clasp, as pictured, or choose optional black cord 16-inch choker, or 24-30-inch long satin rattail neck cord in your choice of colors. All Seven Dwarfs would love one to capture their own memorabilia! Would you like 18" Neck Chain, 24" Neck Cord or 16" Choker?